At the Ramada by Wyndham State College Hotel & Conference Center, our guests have a selection of 284 comfortable and well-appointed guest rooms. All of our rooms are non-smoking and are equipped with lifestyle amenities to keep guests comfortable like complimentary WiFi, premium cable channels, a microwave and refrigerator, irons and ironing boards, and in-room coffee. Private bathrooms are fitted with soft towels, hair dryers, and complimentary signature toiletries. Sleep deeply on any of our pillow top beds, surrounded by luxuriously soft linens as our guest. The Ramada by Wyndham State College Hotel & Conference Center is located off of Highway 322 in the heart of Happy Valley Pennsylvania. Our ideal address keeps guests near Penn State University, popular points of interest, trendy shops, and entertainment, as well as historic landmarks. 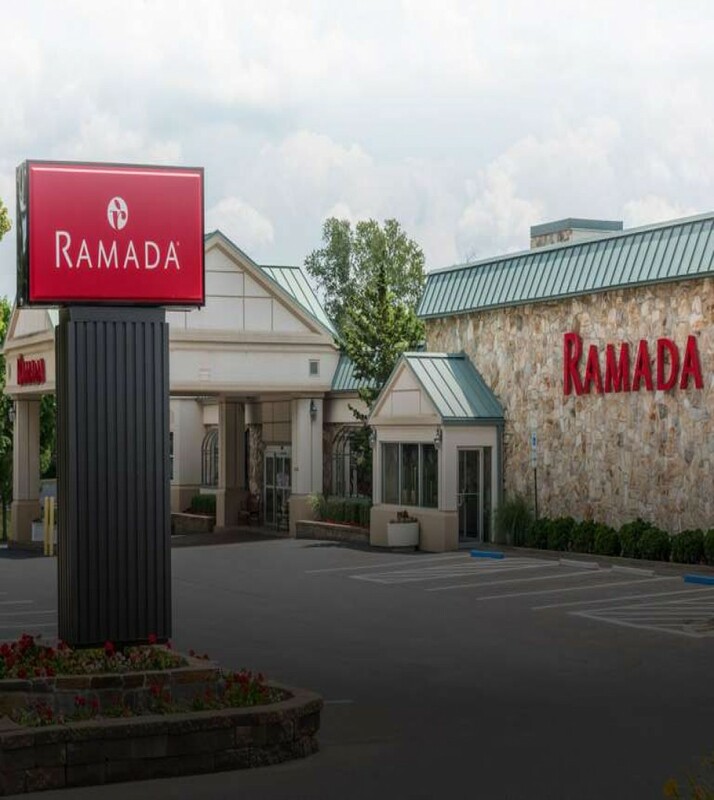 Ramada by Wyndham State College Hotel & Conference Center is proud to provide services for our guests like a 100% smoke-free property, complimentary WiFi, a 24-hour front desk, an on-site ATM, complimentary airport shuttle service, baggage storage, and dry cleaning. For meals, a complimentary full breakfast is available weekdays every Monday through Friday from 6:30 AM-10 AM, and on weekends a deluxe breakfast buffet is available for an additional fee on Saturdays from 7 AM-12 PM and Sunday’s from 7 AM-1PM. We also are home to P.J. Harrigan’s Bar & Grill that serves up breakfast, lunch, and dinner; and offers an impressive wine list and martini menu as well as daily happy hour specials. Additionally, we feature 13 state-of-the-art versatile meeting rooms that offer 20,000 square feet of space for events, meetings, conferences; as well as expert event planners and banquet catering. Complimentary on-site self-parking for cars, RV's, trucks, and buses is available for guests. Children are welcome. Kids 17 and younger stay free with a parent or guardian when using existing beds. All children and adults are charged USD 15 per night for extra beds. Any type of extra bed is upon request and must be confirmed by management. The maximum number of extra beds allowed in a room is one (1.) Rollaway Beds are available upon request depending on availability for USD 15 per night. Infant beds/Cribs are complimentary and available upon request depending on availability. Additional fees are not calculated automatically in total for stay and will be paid separately during guest stay. This property is privately owned, and the management reserves the right to refuse service to anyone and will not be responsible for accidents or injury to guests or for loss of money, jewelry or valuables of any kind. Once checked in, no cancellations. All linens are inventoried: missing or damaged linens will be charged. Any damages to hotel property will be charged an additional fee upon assessment. NO PETS ALLOWED. Guest rooms that have evidence of pet dander and/or odor will be charged a non-refundable fee for deep cleaning services. Any damages to hotel property will be charged an additional fee upon assessment. Guest acknowledges that smoking is not allowed in non-smoking guest rooms or throughout the hotel facility. If anyone in guest's party smokes in a guest room, guest hereby expressly authorizes hotel management to charge credit card to reimburse the property for the additional cost of cleaning guest room. If your reservation has been paid in advance or you elect to pay by cash, a security deposit via credit card will be required upon check-in and will be charged in the event that damages outlined herein occur. The hotel takes a credit preauthorization but does not accept cash deposits.